The Safety & Numbers Blog. Work Safety for the Industry Pro On The Go. Trucker® Series Ladders are rated as a ANSI Type IAA Special Duty Ladder (rated 375 lbs) to provide safe, durable trailer access for truck drivers. We at the Safety & Numbers blog hope you enjoyed the holidays and are looking forward to new opportunities in the year ahead. Having successfully maneuvered our way through various work safety topics throughout the year, starting with Workers Comp EMR Rate calculations and culminating with a Guide to Budgeting for Work Injury Prevention, we are excited to cap off the year with a recent Eureka! moment. What is that Eureka moment, you may ask? We at the Safety & Numbers blog are remarkably capable at sifting through the Internet muck to find diamonds in the rough. So why spend all of our time writing detailed blog posts based on information that we find? Instead, we are going to devote posts to sharing valuable information created at other online resource hubs. After all, we are ultimately here to provide what we think will help you make your own decisions, not simply craft the answers that you expect to find. So if you have come across our What We Found post for December 29, 2014, we hope you will consider the following resources without reservation or bias. Infographics are one of those great yet frustrating things about the Internet. If well done, they simplify information delivery and provide raw data that genuinely helps with decision making. Still, they are designed with an agenda in mind, or why would they be created to begin with? Here are a few infographics that we found on the CCOHS board at Pinterest that we thought worth sharing. One thing I’ve learned from searching the web is that Canada’s online resources are almost always helpful and simplified compared to many of the sales oriented models that are popular today. Here is an CCOHS infographic (Canada’s equivalent of OSHA) that provides some of the most direct methods to avoid slips, trips and falls in the work place. Just don’t Blame Canada if they’re not what you’re looking for, eh. This Safety First infographic is remarkably well-designed and informative, particularly considering it is sponsored by an insurance agency. I found the most interesting portion to be the Top 5 Most Dangerous Industries. Police Officers and Semi-Trailer Truck Drivers make sense, but Janitors and Nurses? Just goes to show that not all injury risks are easy to identify with the naked … er, mind. A Smorgasbord of Training! Call NOW!! We are impressed with the number and variety of resources available at many of the online training sites we have found. Just not impressed enough to provide credit card information for a ‘free’ trial. If you’re a little wary of the similarity between Internet credit card gathering schemes and the miraculous infomercial trends from the 80’s, we invite you to call IAS® at (800) 388-6884 to provide us with the opportunity to help reduce slip and fall safety risks at your workplace. At the Safety & Numbers blog, we spend a lot of time writing about work safety, fall protection, industry news, small business safety policy, etc. etc. etc. The truth is though, we typically gather our information from the same place you do… the worldwide web. We just try to package it in digestable morsels and hit the high notes to keep you informed on the go. So today I am happy to introduce a new blog post category for your enjoyment… ‘What We Found Today’ is intended to cut through the muck and get right down to the business of sharing information that is valuable to you. Without further ado, here is What We Found Today, October 30th, 2014, featuring ladder safety, OSHA News & ANSI guidelines. Have you visited AmericanLadderInstitute.org lately? The site has a new design and content, with updated links to OSHA documents, ANSI A14 documentation, an Online Store, and — of great interest to this blog — a Ladder Safety Training website complete with a Safety Quiz. The Ladder Safety Training site provides training resources complete with Videos and interactive features such as posting the most recent Top Ladder Quiz scores. And it’s free to register! OSHA recently published the Top 10 OSHA violations in fiscal year 2014. As expected, Fall Protection in Construction held it’s rein on the top position with 6,143 violations. The second highest violation category was Hazard Communication (which we touched on regarding the importance of hazard assessments earlier this month). Scaffolding in Construction came in 3rd with 4,029 violations. We’ve mentioned in previous posts that IAS’s Trucker ladders are rated ANSI Special Duty Type IAA. That may mean a lot to you or that may mean very little, which is why we found this link explaining the ANSI rating system for ladders of particular value. Of course, IAS’s trucking work platforms are also ANSI rated for 3 man / 3,000 lbs. We haven’t found a helpful link for that so you’ll just have to contact us so we can let our technical experts explain. With that we will leave you to enjoy the Halloween holiday and stay OSHA safe at work. Most informed industry professionals are aware that OSHA has emphasized the importance of awareness and compliance to fall protection safety standards that are designed to reduce injury risk and fatalities from falls from heights. What may be less clear to business owners in both construction and general industry is OSHA’s dedication to proactively prosecute violations to the letter of the law. Several recent examples of OSHA’s commitment to fall protection injury prevention have shed light on risk areas for small business owners to be aware of. In February this year, OSHA drafted and delivered a warning to the communication tower industry of the increasing fatality rate in that industry, it’s relationship to fall protection, and how strictly OSHA will be enforcing fall protection standards as a result. Another example of OSHA’s firmness on fall protection is in their willingness to prosecute compliance gaps even when a business has taken significant precautions to protect employees. OSHA attempted to prosecute Ryder Transportation Services for an injury to a subcontractor at their site for a fall fatality through a roof skylight that was safely inaccessible to employees. The most important point for concerned business owners in light of OSHA’s increased emphasis on fall protection compliance is their strictness and strategy for standard enforcement. OSHA may potentially cite your business not only for injuries resulting from a failure to provide fall protection, but also in cases where the business did not conduct an appropriate hazard assessment, even at seemingly low-risk heights of 4′. This result is effectively a double whammy effect for a single employee fall incident. As a result, while it’s important to provide proper fall protection, it’s even more critical to conduct and document the proper precautionary procedures for any potential risk area, to save money and administrative battles in the case that a fall injury does occur. Here’s a brief summary of OSHA’s fall protection standards policy, with this in mind. Of course, anyone subject to OSHA violations should fully research the topic on their own with OSHA or a certified compliance consultant. Found in Section 1926.501, these can generally be summed up to require businesses to provide fall protection (guardrail systems, safety net systems, personal fall arrest systems) on walking or working surfaces with an ‘unprotected side or edge which is six feet or more above the lower‘. General industry standards are also stringent, with Section 1910.23 stated to include ‘every wall opening from which there is a drop of more than four feet‘, with that also applying to open-side floor or platforms. This requirement stipulates that risk areas be guarded by a standard railing or other means of fall protection. And remember, the typical fall protection standards citations could be coupled with a citation for Section 1910.132 for failing to conduct a hazard assessment. The application of these OSHA standards and enforcement policy strategies can thus be applied to a variety of settings, ranging from loading docks and flatbed truck beds to onsite or offsite machinery and equipment. Business owner/operators should be aware that even for fall hazards of 4′ or less, a hazard assessment must be conducted and fall protection compliance equipment provided. Of course, we at Innovative Access Solutions are well-prepared to help with your flatbed truck and loading dock fall protection, starting with safety engineered Trucker trailer access ladders and working platforms. In addition, IAS has a great deal of experience providing custom fall protection access equipment to machinery/equipment and multi-level walking or working surfaces at manufacturing facilities, dockyards, construction and mining sites, and public/retail settings. To learn how IAS can design a fall protection access solution for your business, call our engineering team at (800) 388-6884 or submit our Contact form on IAScustom.com. OSHA has produced a number of resources in support of the national Fall Prevention Campaign since its inception in 2012. Perhaps the best opportunity for businesses to show support for this important OSHA initiative will arrive in June 2014 via the National Safety Stand Down for Fall Protection. OSHA is encouraging construction professionals nationwide to halt work activity during the week of June 2nd for the purpose of dedicating time to educate workers about the importance fall protection safety. Employers, contractors, trade associations, government affiliates, unions, and professional societies are all encouraged to participate in the nationwide Fall Prevention Safety Stand Down event. OSHA is even providing a Certificate of Participation for employers that provide feedback to OSHA about their participation by July 15th. Topics of discussion during your stand down event may include safety topics such as ladder safety, fall protection equipment, or scaffolds safety. Participants are invited to discuss work hazard identification and risk management, fall prevention best practices, and company safety policies. Stand Down for Safety will provide the opportunity to directly discuss a preventable and prevalent cause of death or injury in construction. In addition to the opportunity for businesses and organizations to take part in the National Safety Stand Down, OSHA will be sponsoring events nationwide and has provided free education and training resources in support of the cause. IAS will be participating in the OSHA Fall Prevention Safety Stand Down 2014 and hope you are also excited to take part. We encourage you to share your Stand Down stories with us and invite you to call our office at (800) 388-6884 for the opportunity to collaborate, motivate and celebrate our mutual interest in preventing falls. The OSHA Alliance Program is a cooperative effort to leverage resources related to safety initiatives, communication, and training. OSHA Alliance includes ‘unions, consulates, trade or professional organizations, faith- and community-based organizations, businesses, and educational institutions’ that promote work safety and support OSHA’s strategic goals. Alliance members must be committed to working closely with OSHA and establishing teams or individual workers to facilitate the cause, while maintaining and growing knowledge and a safe work environment. In addition to internal safety benefits, Alliance members are able to maintain progressive dialogue with OSHA and other champions of work safety. To learn more, contact your OSHA Regional Office. One of OSHA’s ongoing strategic goals is to mitigate risks and increase knowledge regarding falls from ladders. Fall incidents are the leading cause of deaths in construction and present a wide range of potential work hazards. Considering the variability of material, application, and objective for ladders and stairs, it is not surprising that OSHA produces a significant amount of standards and guidelines for fall protection safety. In addition to OSHA’s ongoing Ladder Fall Prevention Campaign, requirements and resources that support this cause are provided by specialized organizations such as ANSI and MSHA (Mining Ladder Safety). 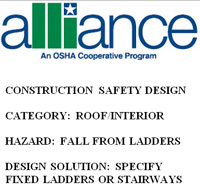 The OSHA Alliance Program has produced a summary solution document as a resource for preventing falls from ladders in construction work environments. This Construction Safety Design Solution recommends specifying fixed ladders or stairways early on to eliminate the hazards and risks associated with portable ladders and to ensure proper ladder or stairway specifications for access to upper levels. The document also provides links to applicable OSHA regulations and ANSI standards for detailed information. Visit OSHA Alliance member Prevention through Design for more work safety resources. 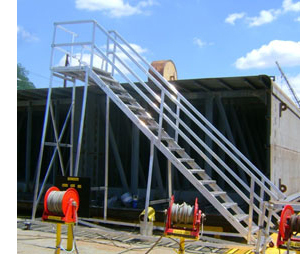 Innovative Access Solutions has been producing fixed ladders and stairways for construction, manufacturing, maritime, energy, and other industries for many years. Information about how IAS can help support your work safety initiatives is available at IAScustom.com, or click the above images to browse our custom design gallery. Personal Protective Equipment (PPE) covers a wide range of industries and safety objectives, from law enforcement to sports, industrial settings, contractors and even casual retail environments. The various functions of PPE are designed to protect hazards in support of work safety policies and controls. These can range from bodily injury, exposure to environmental threats, breathing mechanisms, and much more. With OSHA having a renewed focus on Fall Protection and having imposed new rules for Fall Protection PPE, businesses in a range of industries are investing heavily in fall protection equipment. Consider the following review of Fall Protection PPE equipment and how it can help to reduce injuries at your workplace. Personal Protective Equipment is required by OSHA when positive fall protection such as guardrails, access platforms, gangways, catwalks, and stairways are unavailable. Harnesses and lanyards are considered personal protective equipment since each individual worker must be fitted with the equipment for fall protection safety, as opposed to an all encompassing solution. A lanyard is the rope or other length of connection between a single point anchor source and a safety harness, worn by an employee. Snap hooks, D-rings and caribiners are utilized to ensure a safe connection. Anchors must be secured and can be affixed to a variety of stable structures. The complete fall protection system must be able to adequately support the weight of the employee. Fall protection PPE systems are typically categorized as a fall restraint system, which prevents falls similar to a car seat belt, and a fall arrest system, which catches a falling worker prior to contact with the ground or other solid structure. The advantage of fall restraint systems is the prevention of the need to absorb the shock and otherwise prevent further injury in the event of a fall. Further, in cases where the environment requires rescue efforts in the case of a fall, a fall arrest system is preferred. Generally speaking, fall arrest systems are more safe and less expensive, while more limiting and often less efficient in a workplace. Fall arrest systems often require shock absorbing lanyards and must be carefully considered to avoid further injuring the employee when a fall occurs. These systems are often used in work environments such as roofing, construction, and shipyards. In these work environments, a fall is more permissible compared to a mining operation or manufacturing plant with heavy machinery. Lifelines are a broad range of fall protection equipment that can be applied for horizontal applications such as roofs or ship decks, as well as vertical applications such as enclosed spaces or ladder systems. As opposed to a single point anchor, lifelines provide more freedom of movement as they are typically connected to a cable, pipe, or other continuous structure. Horizontal systems can be designed to provide ultimate movement flexibility via pass through systems, overhead connections, and other similarly unobtrusive mechanisms. 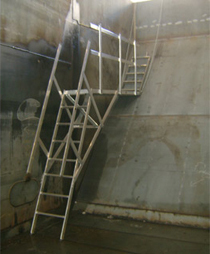 Vertical lifelines can be track based or climb assist systems on ladders at heights, or pulley operated systems for confined spaces and similar applications. In each case, lifelines generally differ from harness and lanyard systems in so much that they are less mobile and more of a direct method for cases where fall protection risk is consistent and eminent.